Profile: The v-Kat is a high performance glove featuring the new patented PUMA Finger Protection (PFP) system, a new dimension in high performance protection gloves. The fixed (non-removable) spines prevent your fingers from hyper-extension injuries. The combination of the wrist bandage and ANATOMIC SUPPORT strap improve the wrist protection. 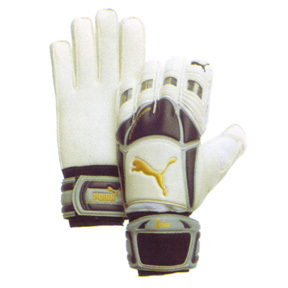 This glove is designed for both training and match play. Backhand: Embossed Latex, PU body, PU inserts, new PFP and Latex Wrist Strap. Features: Ergonomic Cut, Anatomic Flex, Anatomic Support, Ventilation Holes, Fixed PFP sticks, Wrist Bandage.